CHICAGO (May 3, 2018)–Echoing the national NO GAY? NO WAY! 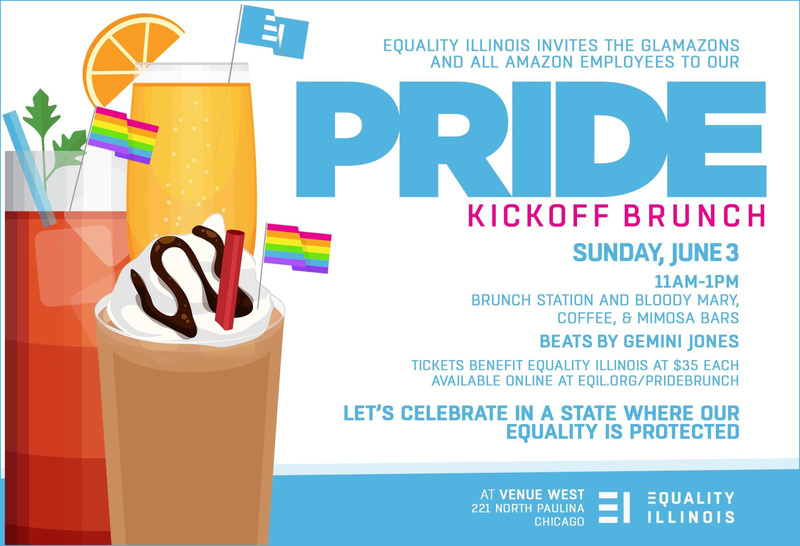 campaign, Equality Illinois is issuing a special invitation for the Equality Illinois Pride Kickoff Brunch to the employees of Amazon to encourage the world’s largest online retailer to locate its new HQ2 in a state such as Illinois that protects the civil rights of lesbian, gay, bisexual, transgender and queer people. The invitation to Amazon employees in Illinois, including the Glamazons, the LGBTQ employee resource group of Amazon, is being shared through social media and in ads in the new issues of Windy City Times in Chicago, which is one of the cities Amazon is considering for its second headquarters, and The Stranger in Seattle, Amazon’s headquarters city. There are about 10,000 Amazon employees in the state. “It would say a lot for Amazon to locate HQ2 in a pro-LGBTQ equality state such as Illinois, and we encourage Jeff Bezos to make that a major factor in his decision,” Johnson said. More information on the Equality Illinois Pride Kickoff Brunch can be found at equalityillinois.org/pridebrunch.